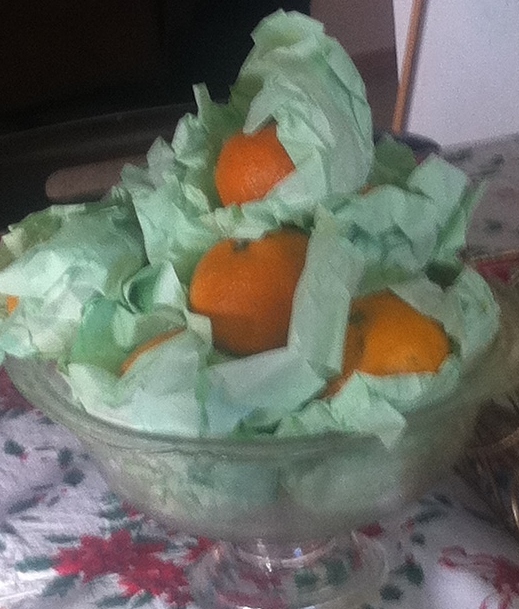 I’m missing my Christmas oranges this year. That’s not to say that we don’t have any oranges, they’re just not the same ones I relate to Christmas. Oranges and other subtropical citrus fruit aren’t grown in Canada due to our cold weather and must be shipped in and/or railed in depending on where it is grown. 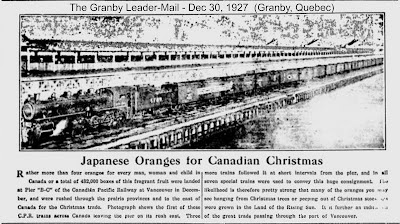 Historically in Canada, there was a lack of oranges in the autumn, and then a burst of excitement as oranges miraculously appeared in time for Christmas. 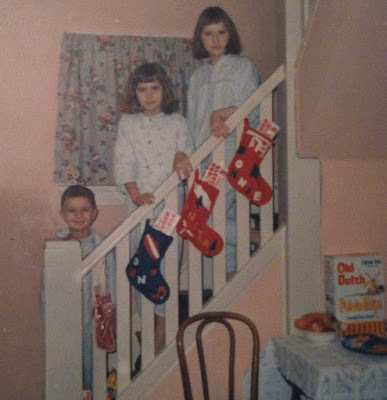 Even during the tough times of my childhood, the one thing I could be sure of was finding a green tissue-wrapped orange in the toe of my stocking on Christmas morning. As in the above photo, a bowl of oranges held a spot on our holiday table along with other treats, such as chips and nuts. The green tissue paper helped develop my anticipation for the fragrant gift inside. I loved the excitement of breaking open that first Christmas orange—the only one I could easily peel due to the skin slipping off the flesh without effort—yet I knew that first juicy bite would have a sour snap to energize my sleepy tastebuds. It was only after eating several segments that I appreciated the tangy sweetness which left me craving for more. And this year, I'm really craving them because I can't find any of the Japanese ones, and not many of the Chinese variety, either. It seems we've seen less with each passing year, especially as the original Japanese mandarins competed for space and attention with the Chinese ones. Except I didn't like the Chinese variety or any of the other tangerines that appeared not only at Christmas, but various times of the year. The small, sweet mandarins and tangerines we're finding in the stores lately is paler, it has seeds, and the thin skin is so tough that I almost wreck my thumbnail breaking through the surface to peel it. So I started wondering what happened. I was hoping my research would give a definite reason, such as a Pacific typhoon, the 2011 Japan earthquake and tsunami combination, or even a trading dispute. 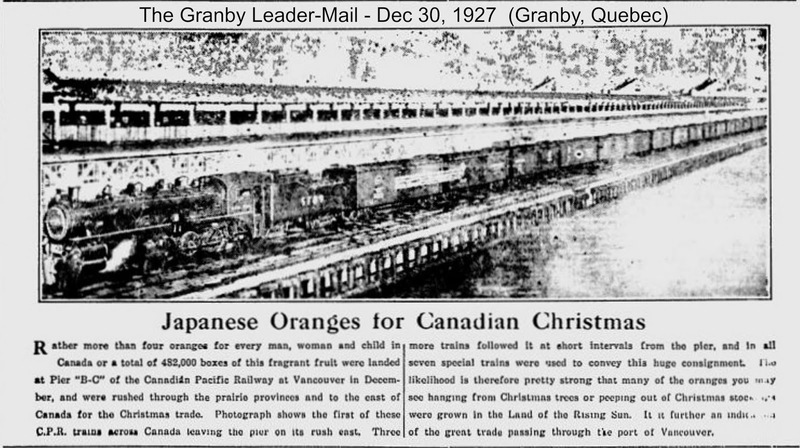 Instead, my search led me on a different quest—the history of what Canadians call Christmas orange. 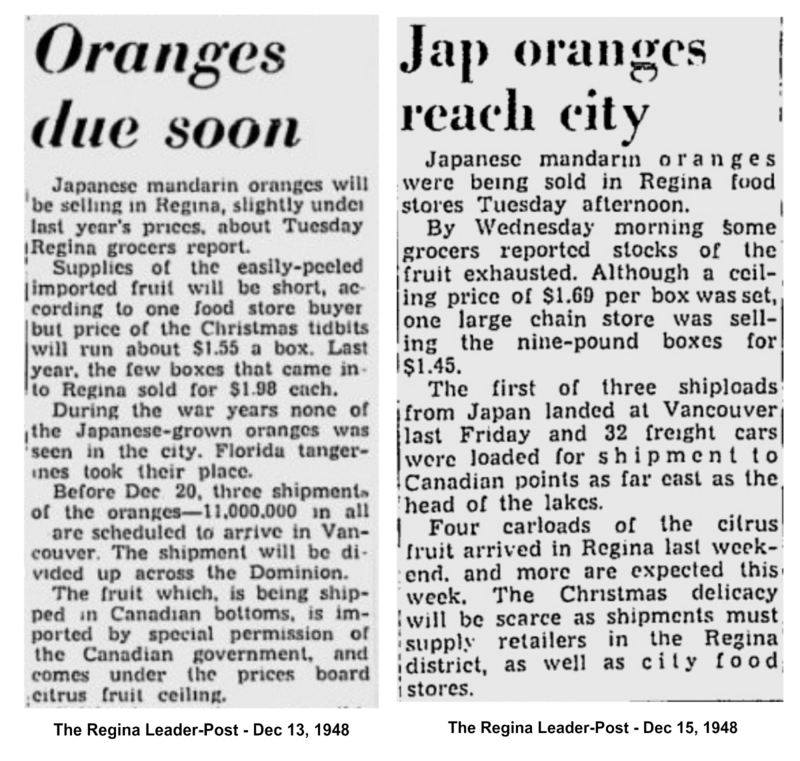 I knew that the mandarin orange was first brought to Canada about 1890 by Japanese workers who received them in parcels in the weeks heading up to Christmas. I was quite surprised then, to find that the first mention of them was not in a Canadian newspaper, but in a 1901 and 1916 American one. 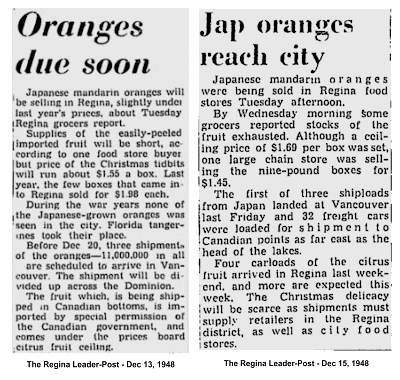 In Canada, the oranges were shipped across the Pacific in 9 pound wooden crates and unloaded in Vancouver. 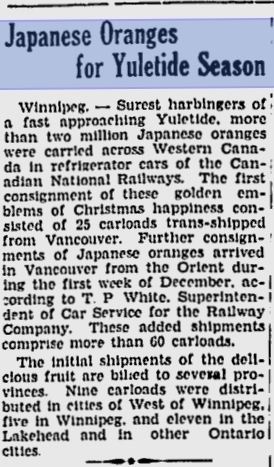 I found a 1926 article in the Montreal Gazette reporting that 1,452,000 oranges filling eleven Canadian National rail cars were on their way from Vancouver, British Columbia on Canada's west coast. So approx 40 yrs after the first oranges came across, special trains of refrigerated cars were needed to carry the shipment across the nation. 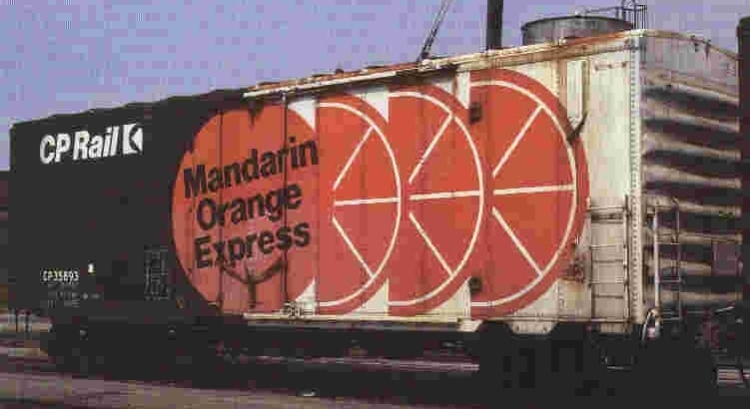 That led me on a search for an image of one of the specially marked trains, dubbed the Orange Express, but it seems they're as elusive as the old Silk Express Trains. The following image is a bit murky, but it's the only one I was able to locate of an orange train. 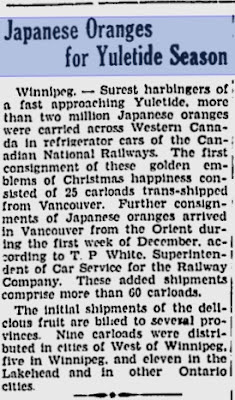 The Japanese orange trade was so successful that a 1931 Drummondville, Quebec newspaper, reporting on an article from the Canadian prairie province of Manitoba, said that over 2 million oranges crossed the citrus-starved Canadian landscape by Dec 7th of that year. And then Canada joined WW 2 and Japan was our enemy. 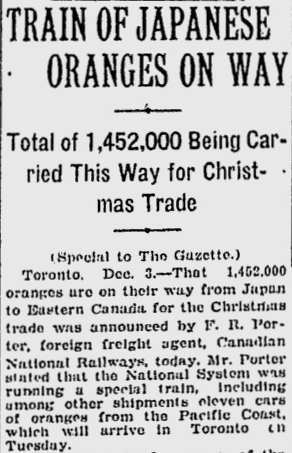 The trans-Pacific orange shipments stopped, and Canadian parents told their children that everything was fine. But Christmas wasn't the same. 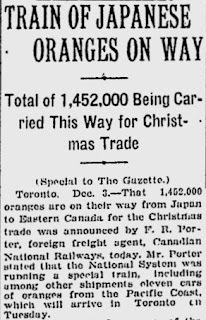 Even with the availability of tangerines shipped in from Florida, Canadians felt the loss of their beloved Christmas orange. When the war ended, countries worked to restore their economies and Canada renewed trade with Japan. But Canadians felt the loss of their servicemen and women who'd given their lives for freedom, and resentment against the Japanese people was hard to put down. 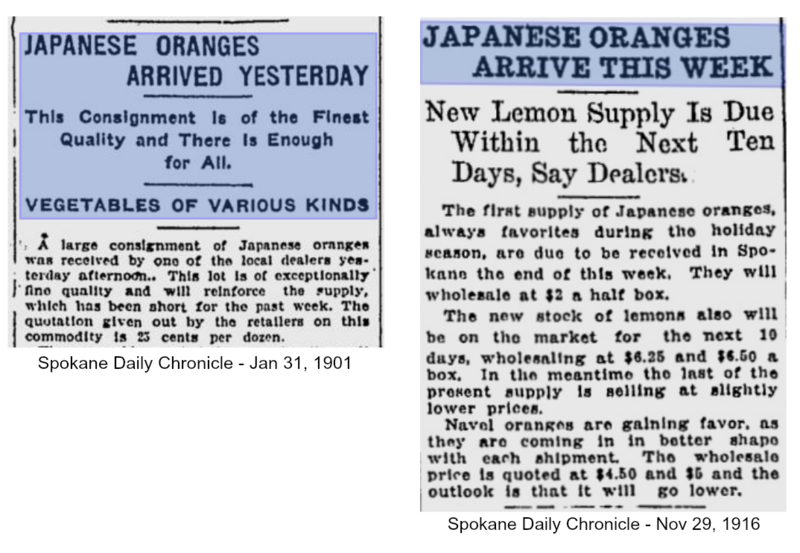 Japanese oranges were scarce during the 1947 Christmas season, but by 1948 they were back with a new name. 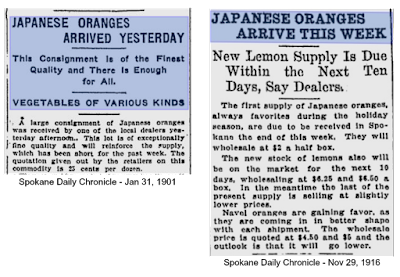 In an attempt to take the onus off their origin, they were introduced as Japanese mandarin oranges. 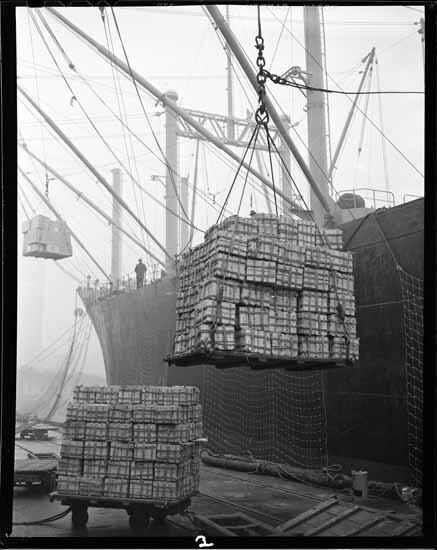 We didn't care what they were called, our special Christmas orange was back—more than 3 shiploads of them filling over 32 freight cars. And that was just the beginning of the resurgence of its popularity. 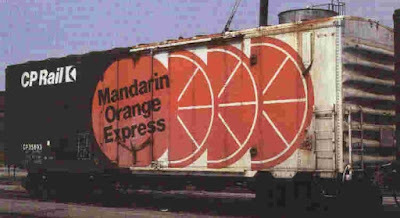 I read that the orange express trains had special markings, but the only one I found was a 1978 CP Rail boxcar marked, Mandarin Orange Express. Only one car carried this paint scheme in a shipment of almost 60 cars. As before, it was elusive to photograph and apparently it has been out of service for some years. I don't know where I found this photo, so if it's yours, please let me know so I can give you the credit. Which brings me back to my original question... what happened to our favourite Christmas orange? Did you receive an orange in your stocking? Care to share? 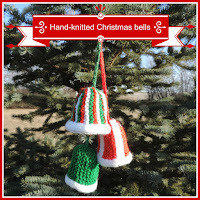 Leave a comment and you will be entered in a draw for a trio of hand-knitted Christmas bells similar to the ones below but with different colours. Deadline for this draw will be midnight, Dec 20th, 2015. 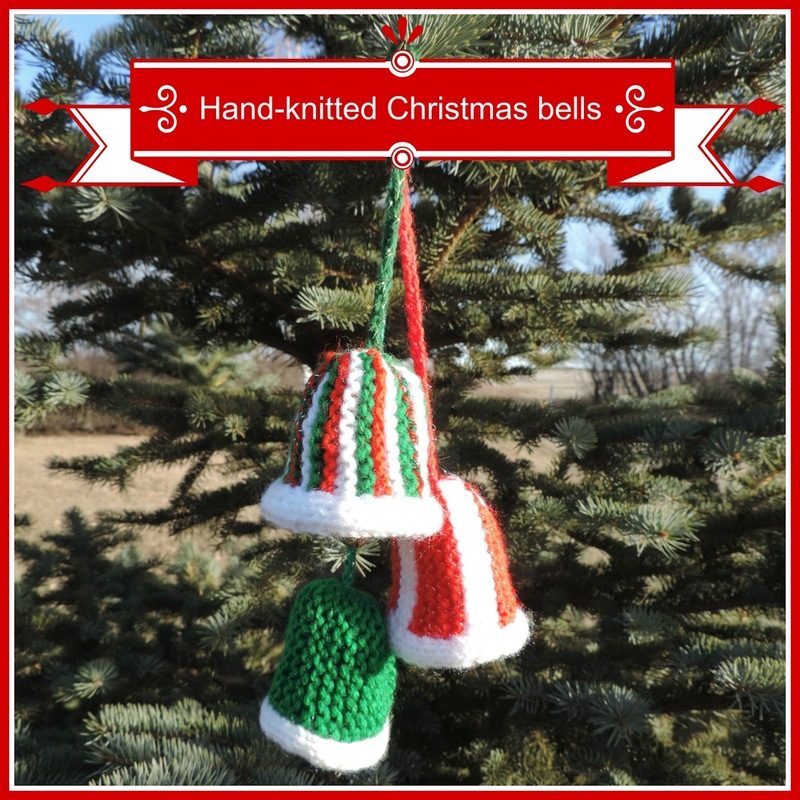 On Dec 21, 2015, I will draw one person's name from my quarterly newsletter mailing list, and that person ​will win the pictured Christmas Bell Trio, specially knitted for this draw by my mom. 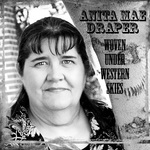 If you'd like to add your name to my mailing list, visit my website Contest page. Since one giveaway is for leaving a comment here, and the other giveaway is for subscribing to my newsletter mailing list, there is a chance that one person will win both bell trios. I love the Christmas bells! Lovely! Anita, Santa used to leave me an orange in my stocking. However, oranges and tangerines are readily available at my house this time of year. At my last house, we had a fabulous orange tree and we used to give our neighbors bags of oranges in December. Oh wow, Susie, what a blessing! I can't imagine having an orange tree in my yard. I got the full sized navel orange in my stocking and I can tell you I wasn't so excited about it. My mother always got one as a child, but I broke the tradition after my children found it uninspiring as well. However, the crates of 'clementines' seem to have brought that winter tradition back. I love your photos of the trains. Very cool! Deb, I like the bigger naval oranges, but I wouldn't be excited to get it in my stocking, either, because that's the orange we have most of the time. I found an article from the war years that states in Britain (following is paraphrased) Christmas fare will be scarce as rations have been reduced and only the very young and very old will get extra chocolate and candy. However, it goes on to say, "The Christmas orange in the Christmas stocking however, is assured. Enough oranges, from Palestine and South Africa, Cyprus and Jamaica, have arrived to give everyone a pound each." Oh, man, we used to get a huge orange and a huge apple in our stockings every Christmas. For some reason, we can't find those big apples anymore. The ones now are only about half the size. And often the oranges are bitter rather than juicy sweet. I don't know why. So, DeAnna, it's not just the oranges that are disappearing. So sad. Where were your big apples grown? I'd forgotten about the wooden boxes the "Christmas" oranges used to come in!! Thanks for the reminder. The oranges we've purchased haven't been as dry and seed-y as the one you pictured. A bad shipment for your area?? Perhaps, Elaine. We'll try another store the next time we go in. Thanks for stopping by. Merry Christmas to you and yours. When I was a child, my grandparents spent their winters in Florida and sent us a box of Indian River citrus every year. We didn't have a Christmas tradition of oranges, but they were always part of winter. My father-in-law, on the other hand, growing up during the Depression in rural Michigan, only got one orange a year - his Christmas orange. He continued the tradition with his children - every child got a paper sack filled with nuts, candy, and an orange. We continued that tradition with our children, but instead of a fresh orange, we give them chocolate oranges - the chocolate is infused with orange flavor and the ball divides into sections. Awh, that's sweet, Jan. And a good way to remember Grandpa. I can't imagine only getting one orange a year, though. I'm not familiar with Indian River oranges, but we often get their grapefruit. I always had an orange in the toe of my stocking, too. Never really knew why, and I should probably ask my mom if it was a tradition from her side of the family or from my dad. Like Deb, I was never terribly excited by that orange, until I read one of the Little House books where the Ingalls girls got oranges for Christmas and they were such a treat because they came from so far away. My grandkids aren't as thrilled with the big navel oranges, but they do like the clementines. Niki, I went shopping yesterday and purposely looked for the mandarin oranges. Found a bin of them beside a broken box that said Korea. But the sign said Peru and the employee confirmed Peru. Strange. Supposed to be seedless but haven't tried them yet. Must dig out my Little House books. And the winner of the Christmas Bell Trio is... Jan Drexler!